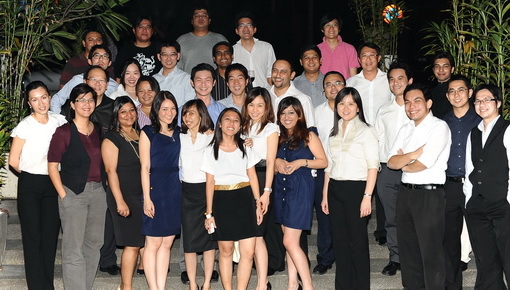 On 15 Oct 2010, the National Young Lawyers Committee (“NYLC”) of the Malaysian Bar Council hosted a dinner at Aliyaa Restaurant & Bar, Damansara Heights, in honour of all Putik Lada column contributors. Putik Lada (which means pepper buds in Malay), a fortnightly column in The Star, is a platform for young lawyers to articulate their views and aspirations about the law, justice and a civil society. This appreciation dinner, attended by many young lawyers and pupils in chambers, started at 7:00 pm when everyone helped themselves to an array of exotic Sri Lankan dishes, buffet style. Members of NYLC, the Putik Lada contributors and other invited guests mingled, socialised and had a jolly good time discussing the articles and other issues in general, as they sampled the delicious spread. As the night rolled on with merriment, Tony Woon, Chairperson of NYLC, gave a speech expressing Bar Council’s appreciation to the contributors for all their hard work and also to Roger Tan, Member of the Bar, and Janet Chai, Deputy Chairperson of NYLC, for organising and editing the articles for the Putik Lada column. It was noted that Roger Tan, former Bar Council member and former Chairperson of NYLC, had been the initiator of the Putik Lada column. Tony Woon also thanked Sumitra Penesar, officer-in-charge of NYLC, Haraesh Kelly, member of NYLC, and Oommen Koshy, Member of the Bar, for organising the appreciation dinner. The dinner party, which ran deep into the night, also saw the presence of Lim Chee Wee, Vice-President of the Malaysian Bar, and also other Council members including Brendan Navin Siva, Edmund Bon and Syamsuriatina Ishak. It was a memorable night and everyone thoroughly enjoyed each other’s company, the food and drinks. NYLC would like to take this opportunity to once again mark its appreciation to the Putik Lada contributors. It is hoped that more young lawyers will put their thoughts to paper and contribute to the success of the Putik Lada column.